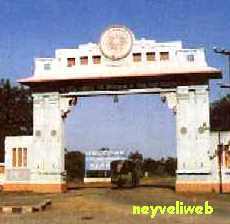 Neyveli was once a small village, surrounded by Cashew forest. Predominantly being a wasteland except the Cashews & Jackfruit trees, the lignite bed was first identified here by a landlord named Jambulingam mudaliar. He was a resident of Vayapattu village near Nellikuppam. He owned about 600 acres of land, covering Mandarakuppam, Cuddalore, Virudhachalam and Neyveli. With almost bulk of these lands remaining uncultivated, Jambulingam mudaliar thought of converting these lands, into cultivable lands. He built a bore well. To his astonishment the waterbed was available only at low depth. In 1932 the cultivation began in the Neyveli village. The farmers found some black brown particles coming along with the water. They just ignored it and threw it upon the sand besides their field. These particles got ignited when they dried up. Jambulingam mudaliar, a well educated scholar, thought that this could be a fuel of great importance, though he was not sure about its identity. He informed about this to the then British Governor urging him to start an industry using this fuel. Jambulingam mudaliar could not get success in his attempts to persuade the Government to start the industry. All his attempts went vain. After a long gap in 1943 the Government started making bore wells. Between 1943-1947 almost 33 bore wells were erected and the potential of the Lignite was confirmed. But only after 1953 the mine work was started. It was a trial attempt. Mr.Ghosh was given the task and about 100 tonnes of lignite was brought out, which got him the name "lignite Ghosh". The lignite was found to be one of the superior variety.